The other day I finally did something I've been wanting to do for many years. 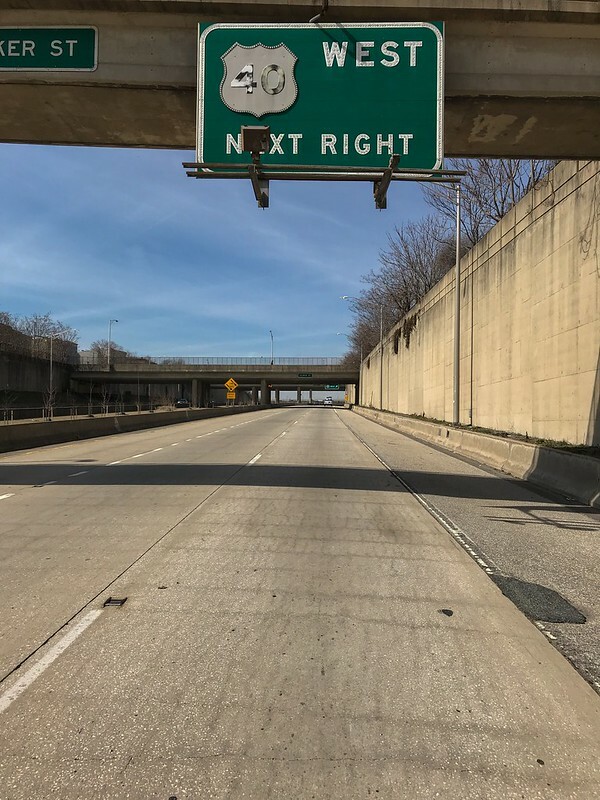 I drove the former I-170 in Baltimore and what a shocker it is. The width of the right of way at the western end may be impressive but the road surface is atrocious. The thumping sound in the video isn't part of the music it is the craters between the sections of concrete. I suspect the appalling pavement may be deliberate as the lack of traffic may see it being used as a drag strip. I wonder what the record is? I did as far as MLK Blvd at the posted limit in just over a minute. Yet it takes an eternity to get from the end of I-70 to Mulberry St. The ramp at the end of I-70 only faces north on Security Blvd so I took Franklintown Road through Leakin Park, big mistake. It's full of speed humps and huge craters. The photo enforced 25mph limit signs are a joke as to reach that speed in places will mess up the underside of your car. It once stood in for an unspecified section of the New Jersey Turnpike on an episode of The Wire. I took this photo in 1980. My 1975 Chevrolet Nova stopped on shoulder. The highway opened in 1979. Oh yes, the Highway to Nowhere...further proof that it was a huge mistake to route I-70 through a city park. 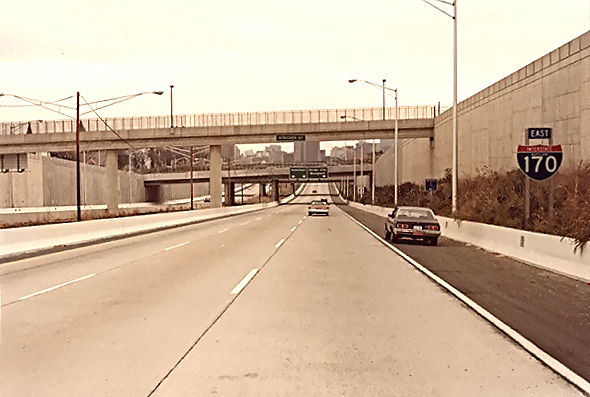 I often imagine that the I-494 Crosstown Expressway would've also looked like this, had it been built. I'm sure it would have looked the same as the various expressway stubs in Chicagoland. I wonder what happened to those shields? In someone's collection I hope rather than melted down for scrap. This may be one of the very few freeways that I would favor tearing down and rebuilding as a surface boulevard. If the traffic is that light and the roadway condition is that bad, it's a waste of money. Also, if you want to “see” it, but are concerned about your personal safety, it’s visible from the right side of northbound Amtrak/MARC trains headed towards Baltimore Penn Station. What is going on with the construction at the west end? Are they expanding the parking area? Watching the video...asides the removal of the roadway and ramp stubs west of U.S. 1, the rest of the old I-170 freeway looks vastly the same from when I first rode on it in 1993. The only other difference is the addition of the tree saplings in the median. Take that, YouTube copyright police! "Boulevarderizing" that would require filling it in. A fairly large expense. For the most part Baltimore metro seems to have a surplus of limited access roadways, some of them just stubs. I think this part of highway is fascinating. Original concrete, signage and the like. I only felt unsafe when I walked it once it was closed off to traffic in 2015. I was like there is no way out except running for the length if an unsavory character came up to me. But it didn't happen. First pic is from that time. The rest are from later visits. Baltimore is a great roadgeeking city. Baltimore is a great roadgeeking city. It is, I was there last weekend and ran across some vintage button copy at the beginning of MD-295. Leftovers from the already-completed MARC station parking expansion. Where they put that parking was an area we toured during the (2011?) Baltimore road meet.